Lanesboro Arts invites community members to share their vision for Gateway Park at a pair of events in the space on in September. Artist Anna Metcalfe will lead two Tea & Conversation events in the park Saturday, September 15 from 10:30 a.m. to 11:30 a.m. and 3:00 p.m. to 4:00 p.m. A free outdoor concert with classic rock quintet The Vintage Tones and the Fat Pat’s Texas BBQ food truck will take place on Saturday, September 22 from 5 p.m. to 7 p.m.
Gateway Park is the natural sloping semicircle area across from the Baseball/Softball Field, on the west bank of the Root River between the County Road 8 Underpass and the Coffee Street Walking Bridge in Lanesboro. 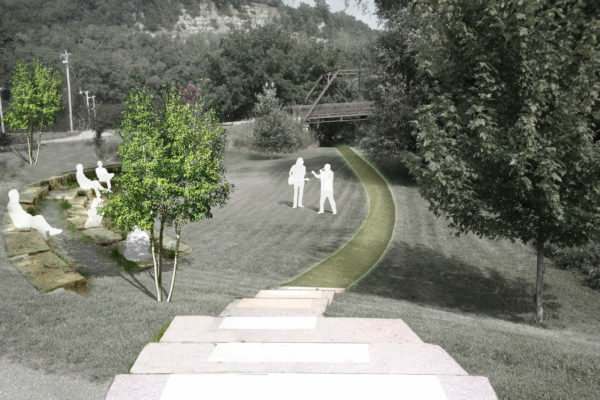 This site was identified by community members at Lanesboro Arts Campus visioning sessions in 2013 and 2014 as a potential future location for stone amphitheater with related amenities. For the Tea and Conversation events on Saturday, September 15 from 10:30 a.m. to 11:30 a.m. and 3:00 p.m. to 4:00 p.m. ceramics artist Anna Metcalfe will facilitate small group dialog with participants over tea and cookies about space and community so that art can be a vehicle for change. Using strategies from a project Metcalfe has used in other communities called “Upstream,” this project seeks to build connections and share stories between both neighbors and strangers within a watershed through tea drinking, a simple and a universally-understood action that will serve as the mechanism by which stories are collected and shared. Rain site is Lulu’s Funhouse. Anna Metcalfe lives and works in Minneapolis where she graduated from the University of Minnesota in 2009 with her MFA. Metcalfe currently works for Springboard for the Arts in St. Paul Minnesota. Interested in the junction of public art and craft, she makes work inspired by water, agriculture, food and community. As a teaching artist, Metcalfe loves to promote collaboration and interdisciplinary learning environments between the sciences and art-making. At the free outdoor concert and community visioning event with classic rock quintet The Vintage Tones and the Fat Pat’s Texas BBQ food truck on Saturday, September 22 from 5 p.m. to 7 p.m., planners and designers from Hoisington Koegler Group Inc. (HKGi) will lead design charrette activities that will allow community members to share their ideas, preferences, and priorities for Gateway Park. Attendees are encouraged to bring a lawn chair or a blanket to the concert. The event is taking place following “Girls Day Out” on Coffee Street and the Lanesboro “History Alive!” pop-up plays. The Vintage Tones is a five-piece rock band primarily based out of Rochester, MN that performs favorites and deep cuts from the 1950s and 1960s, including the songs Everly Brothers and Roy Orbison. The Vintage Tones specialize in performing the music of the Beatles and the music that influenced them, as well as similar styles of early rock and rockabilly. The group consists of Peter J. Post on rhythm guitar and vocals, Patrick J. Heaney on lead guitar and vocals, Lanesboro resident Dave Harrenstein on keyboards and vocals, Geoffrey Forscher on Bass, and Dean Loftus on drums. Fat Pat’s Texas BBQ Food Truck serves traditional Texas-Style BBQ right here in the heart of the Upper Midwest. Fat Pat’s started in 2017 in Spring Grove MN, however owner Patrick Longmire, Jr. has been honing in on his smoking BBQ craft since 2015. His knowledge and skill was obtained and perfected in the heart of the barbeque state: TEXAS!